The Modern List of Birthstones for December are Tanzanite, Blue Topaz, and Turquoise. All are beautiful and interesting stones. 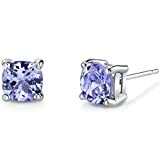 What Are My Choices For December Birthstones? confusing if you let it. There are a total of 13 different stones when looking at the traditional list, zodiac, and modern lists. I have chose to stick to the Modern List of Birthstones to be consistent and hopefully avoid some confusion. Let's take a look our choices for December Birthstones. 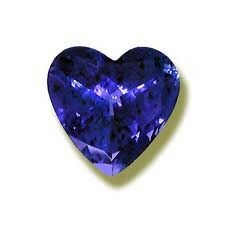 purchase this stone in place of sapphire because it is usually less expensive. 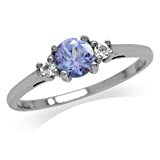 Tanzanite is associated with good luck, contentment, and understanding. The only source for the stone is in East Africa. It was first discovered in Tanzania in 1967. The legend is that cattle farmers noticed that all of the brownish colored stones had turned to a purplish blue color after a bad storm. Lightening had caused a fire and the heat caused the stone to turn this color. Swiss, and London Blue being the three different blue colors available. London Blue is the deepest color and least expensive with Sky being the lightest color. Topaz in its pure state is colorless. The blue color is achieved by heating. 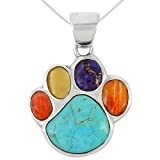 The stone is thought to have cooling and magical properties. Many think it can cool anything from water to attitudes. It is a very hard stone with an 8 on the Mohs scale. Mohs scale is a scale of hardness and defines the ability of a harder material to scratch a softer material. 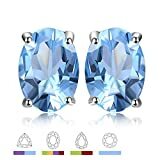 Blue Topaz is associated with royalty and righteousness. 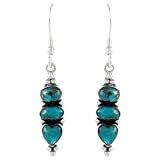 Turquoise is a very old stone mined by early Egyptians. It was used in some of the very first pieces of jewelry. The tomb of Queen Zer of Ancient Egypt was excavated and a turquoise bracelet was found on her wrist. It is thought to be one of the oldest pieces of jewelry ever found. 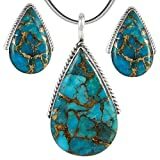 The word turquoise means Turkish stone. It comes from as far away as Iran to as close as Arizona and New Mexico. Its color varies from a really light blue to a greenish blue. It is porous and relatively soft with a 5 rating on the Mohs scale. Indians. The Indians believed it helped them in battles and was also part of religious ceremonies as well. It has been used toprotect horse riders from falling off their horses and used by pilots to bring them good luck while flying. 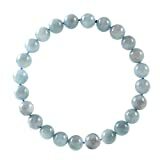 It is associated with good luck, healing, spiritual wellness, trust, and kindness. Thanks ExploreDecor - yeah looks like I have gotten myself into doing one for each month. LOL.. I might have to jump to Sept.. and Aug. (mine).. thanks for reading and commenting. I enjoyed reading this article. I love turquoise but had never heard about its magical powers. I'll be sure to wear lots of it the next time I ride my horse. I am looking forward to the September birthstone article. (Mine of course).